I'm not sure what I like best about Kathleen Warnock's entry in the FRIGID Festival, "That's Her Way." Warnock tells a good story--old lovers reunited after years, one of whom stayed behind in their small hometown and one of whom left. Her dialogue is full of the awkward and strained moments that are typical of people who were once so familiar to each other, but are now little more than strangers. Director Vivian Meisner is adept at letting the story slowly reveal itself, never forcing the pacing, just peeling away scenes like skinning an onion. The actors, Danielle Quisenberry and J. Stephen Brantley, are remarkable, playing younger and older versions of their characters in the various scenes. Even the jumping back in forth in time, which can be a hokey device, is handled very effectively here. All of these combined lead to a satisfying, though sad short play about a moment in a couple's lives, and a decision made in high school that was a betrayal to one and an attempt at salvation to another. Ferro (Danielle Quisenberry) was a serious and ambitious science-oriented girl in high school, too smart to be popular. Stuckey (J. Stephen Brantley), her boyfriend, was a jock, and though he hides it, was one of the smart kids too--he was more socially adept. Reunited when Ferro returns to her hometown as her mother nears death, they begin the awkward process of getting to know one another again. But years haven't erased the damage done when Ferro left, and try as they might, they can't forget or move on. Quisenberry and Brantley really get to shine in their parts. They play the adult versions of their characters with such wariness. From the first moment they meet at Ferro's mother's house, there is tension, and it is a pleasure watching them slowly work through it. When they get to play high school versions of their characters, there is a sweet tentativeness to their interactions, mimicking the tension in their adult version, but for completely different reasons. The early blush of love instead of the pain caused by their decisions. Brantley in particular does an outstanding job bringing a youthful physicality to the younger Stuckey, while Quisenberry excels as the older Ferro. 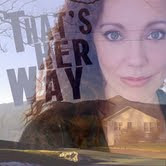 That's Her Way is my first show at this year's FRIGID Festival, and if it is any indication, this is going to be a good year. Album Release Party - What Time Is It, Mr. Fox?